For over 20 years Freightgate has been a leader in applications for Supply Chain Management. The majority of companies rank IT innovation as the competitive tool in today’s information age. Freightgate is known as THE innovator in solutions that streamline the complexities of Global Rate Management, Routing and TMS. Our solutions are delivered over Cloud and Mobile networks. Learn how to reduce legacy IT costs by connecting to the Freightgate Logistics Information Fiber! Freightgate SCM solutions can be integrated into most Enterprise Resource Planning (ERP) systems providing visibility and collaboration tools to proactively manage rates, routing, status, delivery and capacity to minimize disruptions. Our generation of SCM solutions overcomes challenges with volatility and complex supply networks. Our solutions let you manage your entire network in real time. Quickly leverage critical information and analytics, to meet increased expectations to enable collaboration across stakeholders. 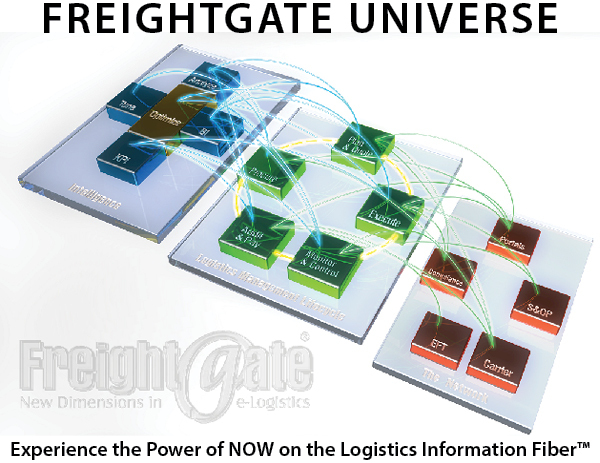 Freightgate’s Logistics Management (TMS) Platform, known as the Freightgate Universe, empowers professionals on all levels to collaborate with global vendors and logistics providers seamlessly on a single common transportation sourcing platform for informed decision-making across the entire global supply chain. It encompasses ISO9001:2008-certified end-to-end transportation management processes from procurement, rate management, optimization, execution and visibility, shipment track and trace, carbon-emission modeling, invoice audit & pay with enhanced carrier connectivity, KPIs and lane based analysis. Freightgate’s latest logistics cloud technology extends transportation management into the new mobile dimension, providing companies with In-depth 360 degree visibility of global supply chain processes and collaboration between manufacturers and its customers, suppliers, carriers and logistics providers. The Freightgate Universe is comprised of adaptive easy-to-deploy applications to help companies leapfrog into the 21st century with minimal start-up cost. Easy integration with ERP, CRM, SCM environments and TMS transportation management systems. Managing carrier tariffs, shipping rates, surcharges and discounts can be a tedious labor intensive task. By replacing countless pages of inconsistent and difficult to understand rates with an interactive, searchable internet native solution, you will gain a whole new level of productivity and win more business in the process. Freightgate supports advanced Rate Management Connectivity concepts for CargoSmart, FourSoft, SAP TM in addition to its open standards compliant webservices offerings. Imagine a world where you go from zero to quote in a few seconds. Freightgate’s Visibility & Collaboration Platform ensures transparency and helps synchronize events along the supply chain with extra features to enhance collaboration. Sharpen your competitive edge by providing tracking information and event management along the entire supply. I-Trek! Mobile utilizes cloud-based connectivity to collaborate with customers and trading partners by sharing vital shipping information. I-Trek provides support tools to make real-time informed decisions that can have a major impact on bottom line performance. In a real time world where efficiency is king; instant response is what fuels supply chains of tomorrow. We have seen a substantial increase in inquiries regarding leveraging our rate engine via API access by various different sub-systems on the client side. By establishing strategic partnerships with our customers we give them a competitive advantage and an opportunity to access a broader range of resources and expertise. This fosters innovation to help generate new ideas, develop better products, and save costs. The Freightgate Universe provides regulatory compliance solutions for importers, exporters, customs brokers, freight forwarders and ocean carriers with 10+2 security compliance and trade data reporting to the U.S. Customs and Border Protection (CBP). Along with functionality supporting U.S. Foreign Trade Regulations (FTR), Export Administration Regulations (EAR), Office of Foreign Assets Control (OFAC), and Homeland Security Denied Person Screening. Start Today – Market Leaders rely on Freightgate’s Logistics Cloud to accelerate their supply chain. Don’t wait!